Appearance: Toads look like toads in our world. They often carry nets and tridents but rarely wear any clothes, if ever. Diet: Who knows what toads eat? We're never really told. Typical Personality: Toads are none too bright. They fight in large groups and seem relatively superstitious. They are often cowardly and, to the reader, can be a bit silly. 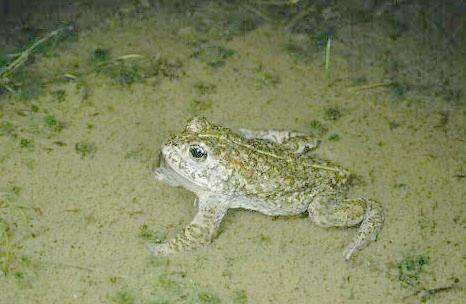 Habitat: Toads mostly live in marshes and in the sand dunes near Salamandastron. Habits: Toads often talk in the third person - I can't remember an instance where any toad has ever spoken in first person. They run words together and croak a lot. Appearance: The British toad has short hind legs and a squat, fat body. Its skin looks leathery and is a mottled grayish-brown color. They can be up to 10 cm in length. Diet: Toads feed mainly on worms and any small flying insects that they can catch with their tongue. Habitat: Toads have been found in shallow ditches, puddles, and even salty areas of water. Habits: The British toad goes into a semi-hibernation in the winter months, staying burrowed in the mud. Life Cycle: Eggs hatch fairly quickly after being laid, and after one to three months, the toads make their way onto land.